Female wolf spider with an abdomen-load of young. Photo by J. Centavo. 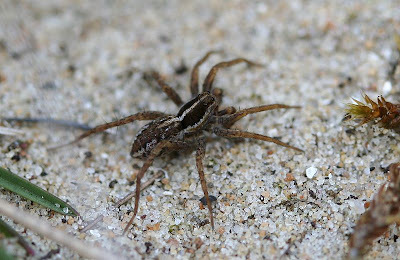 The wolf spiders (I usually call them simply 'wolfies') of the family Lycosidae are one of the more easily recognisable groups of ground-dwelling spiders. Their eyes are placed in three rows clustered together at the front of the cephalothorax with the median posterior eyes large and sitting above a straight row of the small anterior eyes. Some wolf spiders reach relatively large sizes and large wolfies tend to usually be some variant of brown or grey with longitudinal stripes. Most members of the family, particularly the larger species, tend to be morphologically quite conservative and despite the recognition of well over 2000 species in the family (a number that is increasing with no sign of slowing down) distinguishing those species is not usually easy without close examination. Wolf spiders are not often inclined to bite humans and their bites are not usually regarded as dangerous (though a bite from a large species could be painful). A slightly more distinctively coloured member of the family - Geolycosa archboldi from central Florida. Photo by H. K. Wallace. Wolf spiders get their name because most members of the family are active hunters rather than snare builders though a smaller number of genera build distinctive sheet webs with a silk retreat tunnel. Most authors have regarded the sheet web builders as retaining the ancestral behaviour for the family but phylogenetic analysis has not determined this conclusively (Murphy et al., 2006); if web building is ancestral then it has been convergently lost on numerous occasions. Those lycosids that do not build sheet webs may be permanently vagrant or they may dig themselves a home burrow into which they retreat when not hunting. 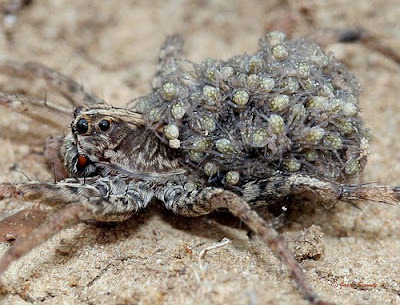 All wolf spiders wrap their eggs in a silken egg-sac which the female carries on the underside of her spinnerets; after the eggs hatch she carries her young around clinging to her abdomen. A more typical lycosid photographed by Sander van der Molen. Recent studies have shown the need for a fair amount of revision of lycosid systematics; the main genus Lycosa in particular had been shown to be a polyphyletic assemblage of conservative large lycosids. Researchers are slowly chipping away at the necessary revisions; a great deal of progress has been made (see, for instance, Volker Framenau's webpage on Australian lycosids), but a great deal remains to be done. 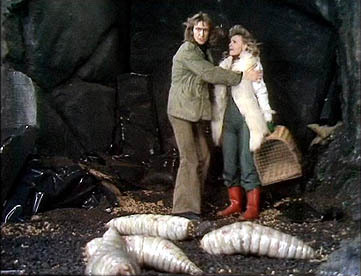 Matters have not been helped by the fact that wolf spiders were another group of arachnids to be subjected to the loving care and attention of Carl-Friedrich Roewer, demonstrating his usual talent for producing extensive revisions based on the most superficial and inconsequential of characters. Also, until recently there was debate over the identity of Lycosa's type species, the Mediterranean L. tarantula originally named by Linnaeus. This species, it should be noted, was the original tarantula; it was only later that the name became associated with South American mygalomorph spiders. Murphy, N. P., V. W. Framenau, S. C. Donnellan, M. S. Harvey, Y.-C. Park & A. D. Austin. 2006. 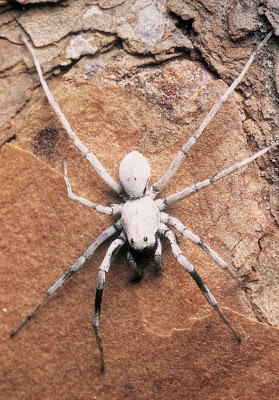 Phylogenetic reconstruction of the wolf spiders (Araneae: Lycosidae) using sequences from the 12S rRNA, 28S rRNA, and NADH1 genes: implications for classification, biogeography, and the evolution of web building behavior. 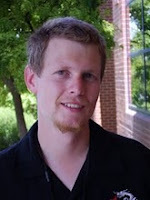 Molecular Phylogenetics and Evolution 38 (3): 583-602. I used to keep wolf spiders as pets as a kid. They do bite by accident (I used to feed them by hand, stunning flies by clapping them with cupped hands, and then holding them while they buzzed. The spiders move quickly to "catch" them, and occasionally would bite me finger by mistake. I never got an infection, but I did rush to the Dettol whenever it happened.